Very often I am desperate for recommendations on the next Korean movie to watch. Thought I would share a list of popular k-movies that I have seen, from my top 10 favorites to the ones that you watch to pass time. Help spread the love by turning this into a group effort. If you would like to contribute your thoughts on a certain movie, contact us with a short writeup and we can include it directly in the post below. Is it a must-watch, pretty good, just another movie, tolerable or downright boring? It was simply by chance that I came across Jeon Woochi starring Kang Dong Won and I started a marathon of all things KDW. Because Kim Kyung-Soo keeps getting into fights, he enters Volcano High, the last school that will accept him as a student. The story is set during turbulent times wherein teachers and students are fighting over the Secret Manuscript in order to gain control. Kim Kyung-Soo doesn't want to fight but his innate fighting abilities keep pushing him towards the center of it all. This movie is a cross between slapstick comedy and wuxia. It's like those old Hong Kong movies such as Hero Beyond the Boundary of Time (正牌韦小宝之奉旨沟女) and Future Cops (學校霸王) to name a few. The plot is absurd, but it's the absurdity that makes the film work. I love the character Kim Kyung-Soo. His bleach-blonde hair and hilarious facial expressions are one of a kind and he has supernatural powers! I like stories that portray a character from humble beginnings to legendary status. We see Kim Kyung-Soo constantly lose to others as he tries to restrain his innate fighting abilities. Until finally, he learns to control his powers and fights to defend the school from the new teachers. The supporting cast really pulls the movie together. I found myself liking all the characters even the five evil teachers because they were too cool to dislike. The action sequences are extremely over the top but being a heavily Wuxia-influenced film, the fight scenes ended up looking surreal in a way that compliments the theme of the movie. Is it a must-watch, pretty darn good, just another movie, tolerable or downright boring? Lee Sang Ho and his friends form a soccer club called Tigers. Yet in a twisted society where cruelty and violence are adamant, Sang Ho and his friends become entangled in the brawl. I first noticed Jung Kyung Ho in Time Between Dog and Wolf and I wanted to see more. I had no idea he could be pull off the character Sang Ho in Gangster High because it was polar opposite to his other roles in dramas that I've seen. I was too familiar with the image of a smiling, playful Jung Kyung Ho that it was hard to imagine him as anything else. Don't get me wrong, I think he's talented but the transformation from comedic and slightly geeky Hyun Soo to complex character Sang Ho in Gangster High still surprised me. I also liked Lee Tae Sung as Jaegu. Jaegu and Sang Ho had such a strong bond it's interesting that the actors who played them are reunited in Time Between Dog and Wolf. 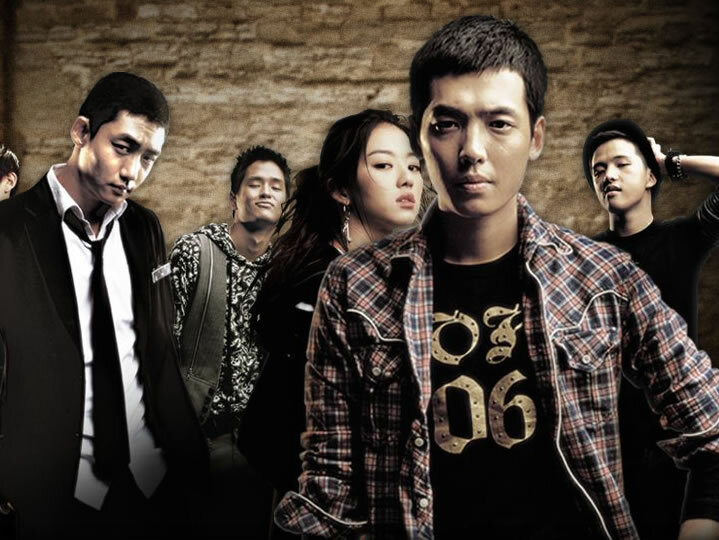 Gangster High is a controversial film depicting the types of violence that teenagers face. It reminds me of the critically-acclaimed Swedish film Ondskan, which has a similar concept. Sang Ho is a calm and rational student but circumstances kept forcing him to fight. It was devastating to see the 6 fun-loving boys who genuinely loved soccer dragged towards a much darker path and even more saddening to think that similar situations actually happen in real life. This film was insane. Its bold portrayal of violence at its worse definitely gets viewers thinking. Particularly memorable to me was when Sang Ho finally picked up a weapon and went berserk. It was one subtle gesture that held a strong significance. Here was a kid who was supposed to go to the Korean Military Academy. He tried not to use violence as an answer and he was wavering back and forth on the question many times in the movie. Towards the end, Sang Ho still refused to bring a weapon but he was eventually pushed towards the edge and we see visuals of blood everywhere, further exemplifying the seriousness of Sang Ho's decision. I secretly hoped that Sang Ho could have been like Michael Corleone in the Godfather who came out on top but that would go against the movie's theme that punishment should fit the crime. Although the film is extremely gory, violence is not condoned because Sang Ho and his friends pay a huge price for what they do. The final scenes that showed the reading of the letter to Sang Ho put a sad yet heartfelt end to the brutality. This movie is about four assassins. The movie is quite old, I barely remember the plot. I do know I was laughing like crazy though. Besides, Won Bin is in it! Seo Min Jun and Han Ji Won are both pros at the dating game. They catch each others' attention and begin to go out. However, they find out that none of their usual tricks seem to work. Will true love find a way through these two players? This is a light-hearted movie full of funny situations. The synopsis pretty much covers the whole story but it's fun to watch Seo Min Jun and Han Ji Won bust out their dating techniques to get to each other. The main guy is Song Il Gook, best known for his role as Jumong in 2006. 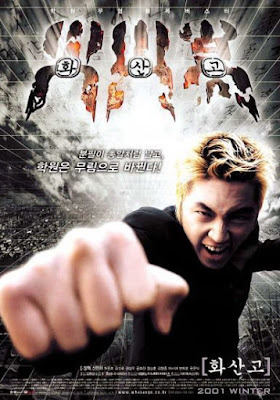 Before Jumong, he did this movie in 2005. I don't recognize the main girl from before but she's quite attractive. And wait till you see her dance in this movie, hot! Below is a scene where Min Jun takes Ji Won to the hospital for medication even though he knows that she's only pretending to be sick. This movie is all about the little lies they say to each other but all their pretending makes the movie even more hilarious. Give this romantic comedy a shot. If I had to complain about something, it would have to be the ending, which felt a bit rushed. Episodes: N/A. This is a movie. Pil-Seong is a countryside police officer leading a simple life as he tries to support his family. A chance encounter with fugitive Song Gi Tae literally ruins Pil-Seong's life. Whether it is to regain his honor, money or job, Pil-Seong takes it upon himself to capture Gi Tae. Simply put, this movie is about a cop chasing a robber. I had high expectations after reading about how this movie did in the box office. Perhaps I set the bar much too high because the movie started out a bit slow for me. For more than 10 minutes or so, I was literally just sitting there waiting for something exciting to happen. The movie's still pretty good so I can't say that I'm disappointed. The director offers a refreshing twist to the cop-chasing robber story. Throughout the movie, Kim Yun-Seok really became the unfortunate detective Pil-Seung whose unfaltering determination garners the moviegoers support. Gi Tae on the other hand is the anti-hero that you end up liking as well. One of them has to lose but I was rooting for both characters. There's nothing worse than an unsatisfying ending so I'm kind of glad it ended with a bit of humor. The last we see of the two main characters is a still shot of them lying on the floor, which sums up the entire movie. Abandoned prince Daejeonghyun is now the last hope of saving Balhae. Balhae's best warrior Yeon Soha is sent to protect the prince. 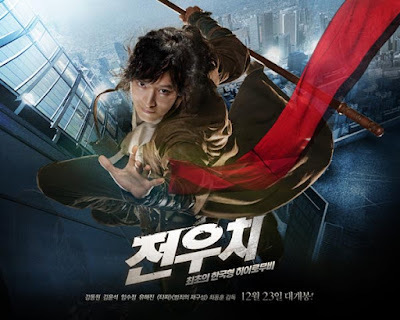 Gun Hwa-Pyung and his assassins are also looking for prince Daejeonghyun and the chase begins. From watching the trailer and reading about the raving comments on Shadowless Sword, I knew that Shadowless Sword was exactly my type of movie. Furthermore, Lee Seo Jin plays the main character and I remember liking his dramas. Shin Hyun-Jun who plays the villain is also a veteran actor. But I dunno what happened. Everyone seems to love this movie except for me. I lost interest after I saw the actors with heavy eye-makeup and acting like they just left the set of Pirates of the Caribbean. I didn't mind the dreadlocks on Shin Hyun-Jun because that was HIS look but everyone else seemed to have a similar appearance. The fights looked cool but it was like watching meaningless fighting sequences considering I skipped through most of the movie. I'd want to give this movie another try, maybe next time.